I have been reading back in some literature on problem-based learning (PBL), and related matters, in preparation for writing a paper on my ongoing course-design process. Along the way, I made a discovery – or a re-discovery – that was immediately and urgently useful in the classes I’m teaching this semester. One of the basic ideas behind PBL is that teaching and learning can be modeled as a cognitive apprenticeship (Collins 1987, Newstetter 2005). The challenge of course design is to create a learning environment in which students, working on their own but with guidance, develop a particular set of cognitive capacities. Part of the knack of course design is to make a realistic assessment of how far students will be able to go in this development within the limits of a semester; another part of it is providing just those kinds of support students need to go that far. What I want to get at in this post is the idea of scaffolding, an artificial structure provided to students that can allow them to operate at a higher cognitive level than they could otherwise reach. The hope and the aim is for students to be less dependent on the scaffolding as they go, until they can work at that higher level on their own. The key, and the thing I was missing, is that scaffolding can and should have a physical component to it, or at least a spatial and even tactile way of arranging cognitive elements that directs the students to make distinctions and connections among those elements.I was reminded of this aspect of scaffolding just in time, just as the students in my classes needed more structure for their work. In my engineering ethics course, students have been using Aristotle’s virtue ethics to sort through the complexities of situations in which engineers might find themselves, but there is a strong temptation for them simply to name the virtue or vice and move on, which really doesn’t help them in imagining the implications of various options, with the fine grained kind of attention they would need to make decisions in their own lives and careers. It’s easy to say: “she is courageous” or “he is hot-tempered” or “they really have no sense of humor.” Those are only labels, empty of any really meaning and easily contradicted. But how do you reply if someone says, “no, I think she’s just reckless”? More to the point, how do you develop the practical wisdom, the finely tuned awareness, to perceive the path toward the good through the hurly burly of a particular situation, with all the tangles and cross-currents of value and meaning and emotion that are in play . . . especially when you may be under pressure and running out of time? To push them toward this kind of practical wisdom, I developed a scaffolding my students could use to think through and use the key ideas of virtue ethics without ever even having to name the virtues or the vices involved. I told them to use the whiteboard or a piece of paper to create five columns, the labels for which are: domain, response, habit revealed, habit reinforced, and appropriateness. The domain is a particular feeling or a kind of activity that is a regular part of human experience. We all experience fear, for example, and desire and anger. We also engage in certain kinds of activities, communicating with others, forming friendships, giving and receiving, telling jokes. There are also activities relative to particular functions and roles a person might have within the community. An engineer investigates the properties and behaviors of complex systems, handles data, creates designs, manages risk to others, and so on. The response is a particular action or project in a particular situation. So, the Spartans are coming over the hill and an Athenian hoplite feels a surge of fear verging on terror, in response to which he breaks ranks and flees back to the city. Breaking and running are the response in this situation. Habit plays a dual role in virtue ethics, as both a source and a product of action. This first take on habit, then, looks backward to the previous actions and experiences of the individual in question. So, another hoplite in the phalanx who sees his fellow citizen fleeing back toward the city might reasonably infer that the one fleeing must somehow have gotten into the habit of backing down or running away from fearful situations. Some degree of modesty is required in making such inferences about others. This aspect of the scaffolding might be of more use in developing a degree of self-knowledge: What are the habits and tendencies of my own soul? This second take on habit looks forward, as action taken now in response to the situation given will leave a kind of residue, a increased tendency to respond similarly to such situations in the future. Even if the poor, fleeing hoplite has never run away before, it might well be supposed he might be more likely to run away in the future. To take an example closer to my students’ experience, if an engineer in training once fudges the data on the test to give the appearance of a more favorable result, that may lower – however slightly – whatever barriers there may be to doing the same thing again in the future. Whether the response to a situation constitutes virtuous action depends mainly on the context in which the situation unfolds and the role of the individual within it. For Aristotle, the thing to note is whether the response and the associated habits contribute to the good and orderly functioning of individuals and communities, that is to say, whether they contribute to the thriving of human beings as social and rational animals. The fleeing hoplite weakens the phalanx and, with it, weakens the defenses of the city. The engineer fudging data falls short of the fullest competence of an engineer, weakens the credibility of the profession, undermines the work of a community of scientific and technical inquiry, and perhaps threatens the good functioning of a society increasingly dependent on technology. 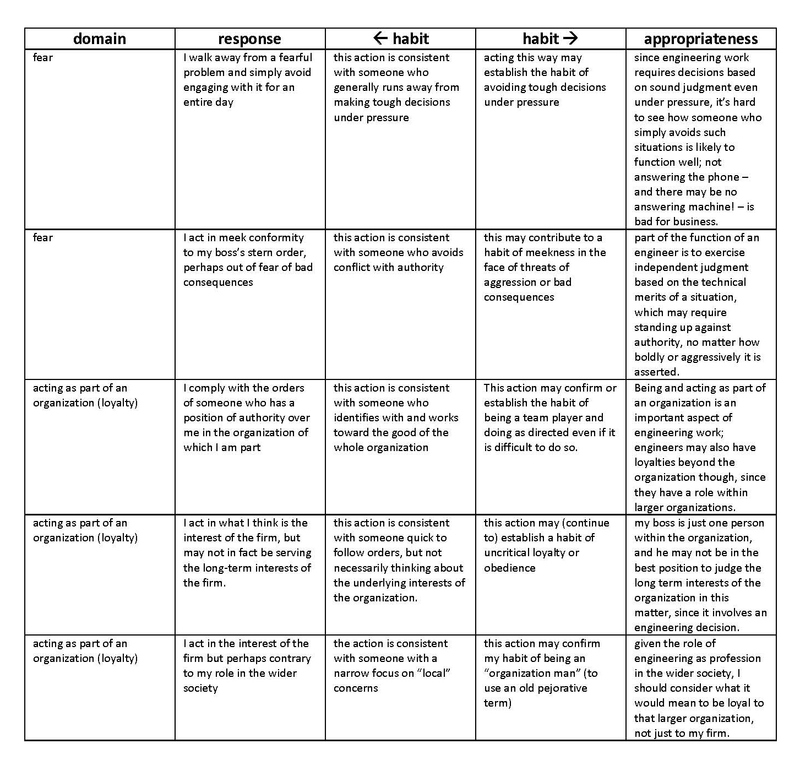 In using this scaffolding in considering a possible response to a particular situation, I admonish the students to be as thorough as possible in identifying relevant domains. Is the situation fearful? Does it make you angry? Does it require communication? Does it require investigation? and so on. I modeled use of the scaffolding for the students, drawing from the TV antenna case I used at the beginning of the semester. I am on the phone, talking to Jan, head of the firm actually assembling the antenna. As soon as I catch on to the fact that she’s asking me for help and that the riggers really, really need help – I can see clearly their solution is a disaster waiting to happen! – I hang up the phone without another word and go out to lunch. This being the 80s, I need fear no interruption of my lunch by any sort of wireless or cellular telecommunications technology. I refuse to answer my phone for the rest of the day. This is only a start, looking at just two possible domains. I told the students that, given the complexity of the situations they are currently examining, and that they are to present and discuss three separate options, they should be sure to work together to fill in the columns and rows of the scaffolding. Collins, A., Brown, J. S., & Newman, S. E. (1987). Cognitive apprenticeship: Teaching the craft of reading, writing and mathematics Technical Reports (Vol. 403). Champaign, Ill. : Centre for the Study of Reading, University of Illinois. Newstetter, W. C. (2005). Designing Cognitive Apprenticeships for Biomedical Engineering. Journal of Engineering Education, 94, 207-213. This entry was posted in Uncategorized and tagged cognition, teaching and learning, virtue. Bookmark the permalink.